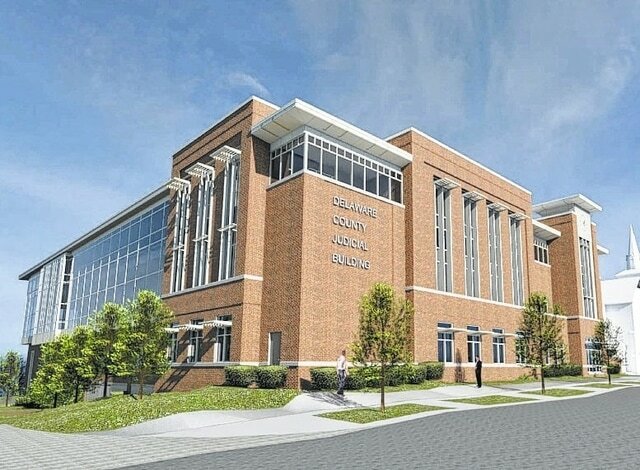 This drawing shows the proposed Delaware County Judicial Building, as seen from Sandusky Street. Members of Silling & Associates and county facilities manager Jon Melvin were seeking a “certificate of appropriateness” from the commission after two informal reviews. A certificate is needed for the new construction in the city’s downtown historic district. If the certificate were to be denied, the applicants could appeal the decision to City Council. In response to commission comments given during the informal reviews, the architects submitted new drawings of the courthouse with slight exterior changes earlier this week. Architect Tom Potts told the commission the building’s design reflects the concept that justice is accessible, and the exterior reflects the interior’s functionality. The design also incorporates elements of the Italianate style of architecture, as well as from buildings on Sandusky Street, the Gazette building, the existing courthouse and the Hayes Building. Six of the seven commission members were present, and a straw poll was taken at the request of the applicants. Three members — City Council member Chris Jones, Joe Coleman and Erinn Nicley — were in favor of issuing a certificate of appropriateness; and three — chairman Roger Koch, vice chairman Mark Hatten and Sherry Riviera — were opposed. Member Kim McMullen was absent. Before the vote, each commission member, as well as two members of the public, spoke out about the new drawings. Most wanted additional elements to soften the building’s facade, particularly along Sandusky Street. Koch said the new courthouse wasn’t visually compatible with other buildings in the historic district. “My concern is it still looks awfully Brutalistic on the Sandusky Street elevation,” Koch said. Brutalism is a more modern architectural style. He said the top of a clock tower looked more like a helicopter landing pad, and suggested a pointed roof. Potts said doing so would make the tower look like a rocket. Riviera said that while she liked the most recent enhancements, she was still looking at a modern building in a historic district. She also said the Gazette building should not have been considered a design influence. “The Gazette building sticks out like a sore thumb,” Hatten added. Hatten said the building reminded him of many high schools or corporate buildings. From other angles, he said it looked like a Malibu beach house or a loading dock. Coleman said the architects did a good job for what they had to work with. Nicley said he agreed with Coleman, but with some reservations. Among his concerns was a multiple-story Lady Liberty decal in a stairwell that could be viewed from U.S. 23 or Union Street. Jones said he thought the design fit and was a good use of taxpayer money. He noted that one couldn’t go back to the 1800s. A couple of hours into the meeting, Efland proposed that Silling incorporate the comments into some new drawings, and hold another informal review prior to the next official commission meeting. After a recess, the applicants agreed to the proposal. The commission unanimously agreed to table the county’s request until the next official meeting. Efland said the county could continue its process of going to the City Planning Commission in August, even if the Historic Preservation Commission hasn’t made a decision on its end. Melvin said none of the changes being sought would affect the building’s foundations or interior.